The manufacturing sector has been through a significant period of change over the last few years. The most recent economic downturn has led many manufacturers to re-think their business strategies. 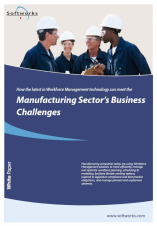 This paper explores how the latest in Workforce Management (WFM) technology can assist manufacturing companies of all sizes to increase operational efficiencies, reduce labour costs and attract and retain skilled workers leading to a more profitable business. Business challenges in the manufacturing sector including; Controlling labour costs, maximising efficiencies and being agile. Forecasting production demand and determining employee supply based on this demand. Building cost effective scheduling and staffing rosters that meet budget requirements and constraints. Attracting and retaining skilled labour. How WFM Solutions can assist manufacturers meet these business challenges. How advances in WFM technology are driving business performance and operational efficiency.